The foundations for Inspiring Views were poured in 1998, with the project completed in 2000. Located on a previously vacant 100-acre property with stunning 360 degree views, the homestead design creates the illusion that it has been here for 50 years or more, and complements the owner’s 40-year collection of lovingly restored vintage and antique furniture and curiosities. Features include historical church architectural items sourced from four different churches, mostly from the Yalca church in north-central Victoria. 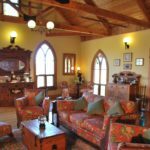 The main house alone incorporates 13 Gothic windows and doors, with many more incorporated into the quirky outdoor buildings (wait til you see the chook house!!). 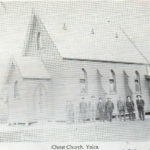 The Yalca Christ Church was completed in August 1888, held its last service in 1976, was sold in 1981 and later demolished. Many of the intricate fixtures lay on the banks of the Murray River and succumbed to numerous floods before being salvaged and lovingly re-purposed. All of the Gothic windows, doors, roof vents, and trusses have been brought back to life, and are woven into the fabric of Inspiring Views’ buildings and creations. 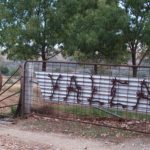 The property was originally named Yalca given the strong connections with the church, and the name is still displayed on the entrance gate. Inspiring Views Artisan Homestead has a dedicated “recycle and reuse” ethos. Historic items and old building materials feature richly in the rustic artworks and buildings: one man’s cast offs are another’s treasure! Old items are lovingly repaired, reinvented and given a new purpose and home here. Margaret has been welcoming International visitors for almost a decade – a very pleasurable and memorable experience for all. In 2017, she formally opened the doors as a B&B to share this picturesque and peaceful retreat with a wider audience. Margaret loves to create, handmake, reuse, recycle and reinvent, and her property is a testament to this. She adores hosting and sharing the extraordinary beauty, bountiful wildlife, diverse nature, peaceful sounds and natural elements that are all part of Inspiring Views’ inimitable environment. Food for the soul..